In small bowl, mix sauce ingredients; refrigerate until serving time. Set oven control to broil. In medium bowl, mix all burger ingredients except buns. Shape mixture into 4 patties, each about 1/2 inch thick and 5 inches in diameter. Place on rack in broiler pan. Broil burgers with tops about 6 inches from heat 8 to 10 minutes, turning after 5 minutes, until thermometer inserted in center of patties reads 165°F. Place burgers on buns. Serve with sauce. The flavorful yogurt sauce also tastes great on pita bread wedges or use it as a dip for veggies. 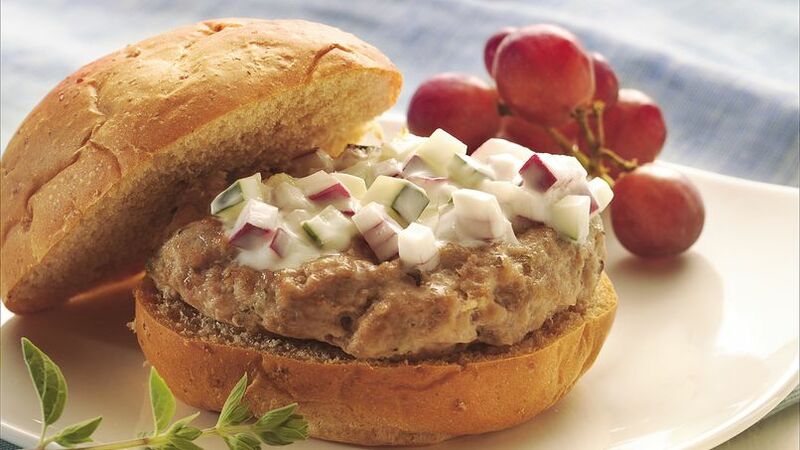 Traditional dill-yogurt sauce makes a tasty topper for turkey burgers that also stay moist with the addition of yogurt.